Unless you enjoy the spontaneous discoloration of fabric, broken frames, rusty hardware, and the frustration of throwing out umbrellas at the end of each summer, it is best to buy a high quality commercial umbrella. What makes a commercial umbrella better than an economic, big box-store umbrella? Commercial umbrellas for hotels, restaurants, and other outdoor and hospitality areas are built for style and function. Poles come in a sturdy aluminum pole. Finish options include black, bronze, wood grain or silver. Poles are strong and rust resistant. 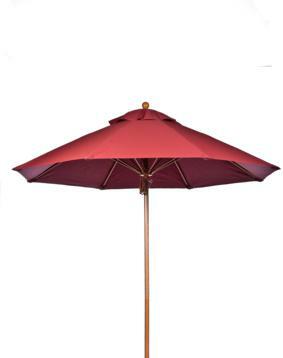 The frame (also called ribs or arms) of the umbrella that support the fabric material come in fiberglass or aluminum. The heavy duty frame is designed to withstand sun and wind. High performance fabrics provide durable shade options that are perfect for any outdoor setting. The material is a 9 oz. Sunbrella® marine grade acrylic fabric, 4 or 8 panel umbrellas. Color options include Black, Navy, Red, Burgundy, Green, Brown, Beige, Green, Blue, Red, Black, Tangerine and Yellow. The Sunbrella® fabrics are fade and mildew resistant, breathable and water repellant. UV-resistant pigments are blended into each fiber for outstanding colorfastness and long-lasting durability. Outdoor Restaurant Seating works with U.S. based manufacturers that have several decades in producing hospitality furniture. A four panel, 6.5 foot diameter umbrella with an aluminum pole and aluminum or fiberglass frame. An eight panel, 7.5 foot diameter umbrella with an aluminum pole and aluminum or fiberglass frame. An 8-panel, 9 foot diameter umbrella with an aluminum pole and aluminum or fiberglass frame.